Marvel Studios pulled out all the stops with the summer release of Guardians of the Galaxy. 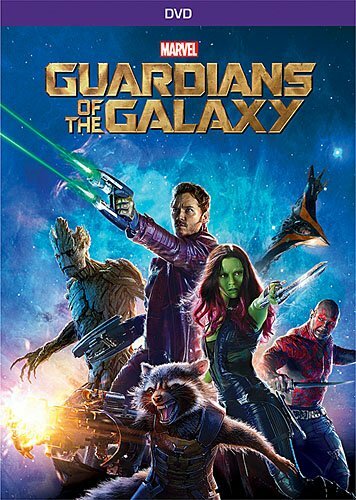 Part human actors and part computer generated images, this action filled science fiction adventure tells the tale of how Peter Quill, aka Star-Lord, steals a powerful orb that is also coveted by Ronan the Accuser. Apparently, whomever has this orb can control the fate of the entire universe! Who is Drax the Destoyer? Why is he so mean? Once upon a time, Drax was known as Arthur Douglas, a human being who was minding his own business when a fateful event occurred. The evil Thanos believes that Arthur and his family spotted his spaceship while they were driving in their car across the Mohave Desert. In order to make sure that no one sees him, Thanos kills the adults, but not their daughter, Heather. Thanos’ father takes her to raise and she later becomes Moondragon. If Arthur is dead, then how did he become Drax? Kronos, who is the grandfather of Thanos, takes the spirit of Arthur and places it in the body of the newly formed Drax. His mission and sole purpose of creation is to kill Thanos. Over time, he redevelops memories of his lost family, and this causes him great anger and sadness. He does possess certain superpowers, like being able to blast energy though his hands. As one can tell from his super muscular build, he possess incredible strength and stamina, as well as speed. Because of the reason why he was created, he can sense where Thanos is located. Your son does not need to work out for months in advance before Halloween to get the look of the muscular superhero. The polyfil muscles are built into this one piece jumpsuit, which will give your child a layer of warmth if the weather is cold on Halloween in your part of the country. There is a red tattooed design which colors both the chest and the arms. Part of the design includes a skull, as well as bones. Pretty scary stuff! The pants are black and throughout them there is a silver design running up and down each pant leg. The bottom has silver buckles so it looks like he is wearing boots. Add some comfortable black high tops and the costume is complete! Included with the puffed out chest and arms is the official Drax mask. It has extra large eye holes for seeing, so your child can safely go trick or treating. There are raised red tattoos on both sides of his face-the scars that appear are just like the ones that are on his heart. Drax uses a dagger as his weapon. Of course, this part of the costume could not be brought into schools, but it will look creepy as your son carries it when he goes out asking for candy with his group of friends. Boys who love the Guardians of the Galaxy will be wanting to dress up like Drax the Destroyer this upcoming Halloween season. This is one scary dude! Watch Drax and the gang over and over again!